Hello fellow brothers and sisters in Christ. 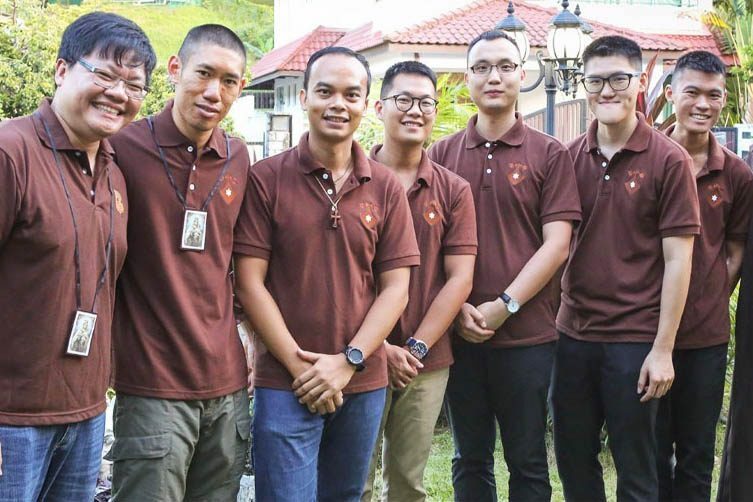 My name is Francis, a fellow parishioner in SFX from baptism as a baby, and now in my postulancy with the Order of Carmelites Discalced in Singapore as I seek to fulfil the calling to serve God with everything I have by offering myself to His service in a life in religion. I had been raised from young with a very strong Catholic background and wonderful parents, and had served as an altar boy in SFX as well. This gave me a good grounding for growing up in the church, being around the priest and nuns in church, and an understanding of a little more of what happens behind the scenes besides just the Sunday mass. Unfortunately, this would not be the initial foundation of my current calling to this vocation. As I entered school and faced more of the world around me, I suddenly felt all the more out of place, surprised that Jesus was not the common topic of conversation among friends, and I could not explain the purpose of why I was spending time at church other than that it was just an obligation that I grew up learning about. Wanting to be more current with the world and expecting to get on better in life without the attachments to the church, I attempted to move on and forge my own way ahead by my own strength. I relegated to being a Sunday Catholic, focusing on what the world told me was the measure of success. I was doing well in studies, got a sponsorship and a secured job for the future, and was doing well with sporting achievements too. With things going well, I really saw little need to turn to God for anything. But it was really a question of when, not if, the storm will hit. 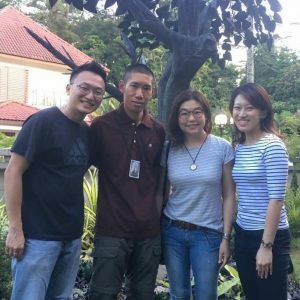 I was being pestered by an old church friend to come and join them for some bible sharing sessions with their youth community, and so I came along just for the sake of it. And it was at this moment that the things around me, the things I’ve been building my life around, started to collapse. A fall-out with a project group at school meant possibly failing and repeating a year of studies, possibly losing out on the job sponsorship, and major injuries that left me unable to compete in sports, among other things. Why was this happening the moment I was spending more time in church? At the time, I didn’t know, and the only natural thing to do was to blame God, and to continue to blame Him was actually my main reason to stay on in church. And while I was praying for an escape and a fix to all these problems, He actually answered with something better. He gave me a new foundation to build my life on; a foundation grounded on Him. Through prayer, there came the realisation that the house I’ve been building on sand up till this point was already poised to collapse, but I was still given the freedom by God to choose to make those wrong choices in life, so that I could see that my foundations were weak. He gave me a community with which I could turn to and share with, pray with and grow spiritually with. The Mustard Seed Community was, by no means, a community of perfect, holy people. They were in fact just the same as me; people who were broken and hurt, but people who knew where to build their foundations on, and who were able to hold on to the true pillar of strength which was Jesus. With trust in God, I managed to get through those storms, though barely, but now with a renewed trust and faith in God. Putting Him first allowed me to know my proper direction in life, and I lost interest in pursuing the power and wealth of the world. In the community of Mustard Seed, I also saw the face of Christ in many others, who gave so much of themselves to the service of the church and charity, not out of their wealth, but really everything that they had. While heading out on a mission trip to Baguio, Philippines, to reach out to the children in the slums, I was all the more affirmed of the joy that only God could provide, because in the faces of the poorest people who had absolutely nothing, I could still see a joy in the faces of those who trusted fully in God. It was a joy that I’ve never seen on the faces of anyone in Singapore, rich as they may be and happy as they may claim to be. I sought to live out a my life under a vow of poverty, living in contentment with what I had, and trusting fully in God everything else in my life. Through the various missions and retreats I worked with in the community, the calling to serve God more and more grew stronger, and I knew that nothing less that the offering of my whole life to Him would be enough. It is not what any conventional person would say is the way to happiness. It is not what the world professes to be what living the dream is all about. But I’ve been blessed to have seen where the end state of that life would be, and there would be no happiness or joy in pursuing my own goals and desires in life, because I don’t really know what it is that I myself want in life, and I was just following the blind ways of the world. And so in entering a life as a religious, neither do I claim to know where it is that I’m heading towards in the future, by I know for certain that with my loving God leading the way in my life, I cannot go wrong. In faith, I take this blind step forward, trusting fully that His will, not mine, be done.